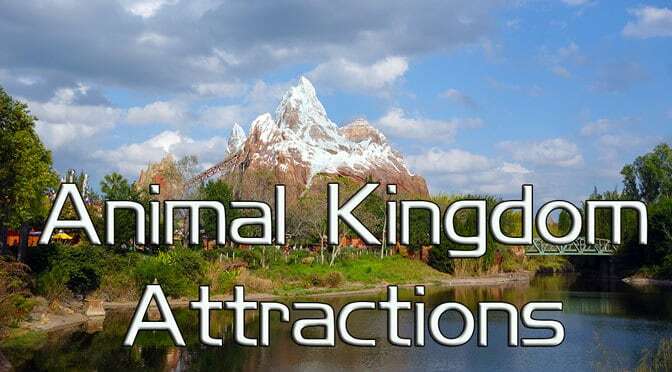 Animal Kingdom offers very few rides and attractions and is often treated as a “half-day” park. Many guests tend to leave by mid-day. I’ve often arrived in the late afternoon and was able to walk on many attractions. I recommend that you arrive 45 minutes before park opening and head straight for Navi River Journey and have a Fastpass for Avatar Flight of Passage. If you find long lines at the Mickey Touchpoints, enter through Rainforest Cafe, which offers an entrance through its gift shop. I don’t see using Fastpass+ for shows as beneficial except during holiday seasons or if your family isn’t interested in riding Everest or Kali. In the busiest seasons arrive 20-30 minutes early for shows if you choose not to use Fastpass+. The absolute worst day of the week to go to Animal Kingdom in terms of crowds and wait times is when it has Extra Magic Hours. If you plan to use the Extra Magic Hour privilege, go on Monday. The wait times on an Extra Magic Hour day versus the lowest average peak waits of the week can be 1.5 to 2 times as much! Click on any name for FULL information on the attraction! Earn badges will learning about animal behavior. Caw, Caw, Roar! Are they still letting people in earlier than rope drop to get into pandora? Also how are wait times first thing for rides of passage? What time is the opening show? Is there any kind of list of attractions and restaurants that are going to be in Pandora? Any predictions on how Pandora is going to effect the crowd levels? Or how long after it opens you might have some ideas on it? Trying to plan my last week of Aug trip and with this and the predicted MNSSHP that week also I am having a little trouble planning what days to do what park. I’ll bet we see an overall increase about 3 to 4% this summer. It will attract more to AK and take away some from DHS. Can’t build plans for it until I know if they will offer FP and how limited they will be. Not much of a sign up needed. You just pick up a booklet and do the oath. The stands open at 9am. We are going on Sunday, 4/26. We are wanting to do Hollywwod Studios & Animal Kingdom that day. I want to arrive early to sign my boys up for Jedi Training in the afternoon and then do a FP for the K Safari at AK. Is that possible or should we stick to HS in the morning & do FP for rides there that are good ones in the morning? We have the Park Hopper tickets. Also, can we do 3 FP’s in each park or just 3 a day no matter what park. Thank You! You’ll need to arrive at DHS before rope drop to sign up to participate in Jedi Training. You can choose your show time. You choose 3 FP for a single park. After using them, you can book extra one in same or different park. Read my FP+ information above. Question, if I use a ticket to go to Animal Kingdom and only stay for a half day can I use the same ticket to enter another park or do I have to use a second ticket to visit another park on the same day? Thanks. Can only do that if you have a park hopper. Cannot use a second day’s ticket on the same day.